Filed under Apologetics, Biblical History, Is it Christian? 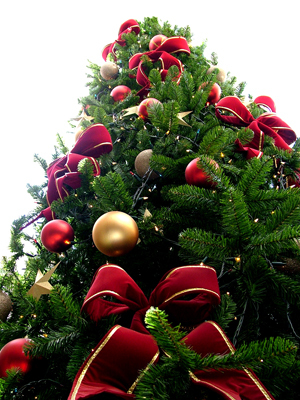 The Christmas tree is said to have originated in Germany with the decoration of pine trees with fancy ornaments. However, there are alternate theories that suggest otherwise. In fact, there are many legends about the Christmas tree that led to the widespread belief that the Christmas tree is an essential part of the Christmas season and its celebration. There is the legend of St. Boniface, an English monk, who is said to have saved a child from being sacrificed by pagans. When they were gathered around an oak tree to sacrifice the child, the Saint flattened the tree with one blow of his fist. A small fir sprang up in its place and St. Boniface told the pagans that it was the “tree of life,” and represented the life of Christ. Another legend traces the story of the church reformer Martin Luther. It tells of his journey through a forest on Christmas Eve, as he was amazed by the glistering of the many stars that shone through the evergreen trees. He cut down one of the trees and took it home. The truth is that the Christmas tree tradition has been around long before the Germans, St. Boniface and Martin Luther. The Nordic pagans and the Celtic Druids revered the evergreen tree as a symbol of everlasting life and hope for the return of spring. While other plants and trees died, the evergreen trees remained alive continually; hence, they were revered as manifestations of deity. As a symbol of prosperity, the Druids decorated the evergreen outdoors. It was the Scandinavian pagans who were the pioneers in bringing the decorated trees indoors; and the Saxons, a Germanic pagan tribe, who were the first to use candles to illuminate the tree. In addition to these pagan rituals, the tree is also linked to the celebration of the Winter Solstice. Pagans would celebrate the Winter Solstice, and as a part of that celebration, they would decorate trees. This celebration represented the end of the long, dark winter days and the beginning of the spring and its connection to life. The triumph over the winter darkness was the reason for the celebration. There are many other theories about the origin of the Christmas tree. Researchers have failed to accurately pinpoint a single origin, but it is correct to state that it evolved from pagan traditions. Understanding how the tree was used in the past will shed light on its meaning in the Christmas celebration. Many Christians unwittingly partake in tree decorating without knowing the cryptic meanings behind the adoration/decorating of a tree. The fact that the evergreen tree was considered in pagan religions to symbolize everlasting life, robs us of the reality of Jesus’ supreme sacrifice that enables us to have true eternal life. The evergreen tree is believed by some pagans to hold continual life, and as such, is commonly used in pagan worship and celebrations. I often wonder, do believing Christians really know what they are doing when they place a Christmas tree in their home? Do they really believe that the decking of a tree has something to do with the birth of Christ? Those are the words of the Lord from your Bible. Why do so many Christians overlook this very important chapter in the Bible and do precisely what God warns us not to do? It is certain that God condemns such practices and warns His people not to adopt these pagan ways; yet many people who consider themselves Christians, do exactly that. Here is something that all Christians should consider. If God was against the cutting down of trees, bringing them into our homes and decorating them way back then, and He is the same yesterday, today and forever; do we honestly believe He changed His mind and is now somehow happy with it ?